Hi All! Long time no see. I got a WordPress notification the other day and realized that it’s been SEVEN months since I’ve updated this blog!! During this time, I was caught up with work, found a new job, and cooked a lot of good food. Time flies when you are having fun, so here is a recipe that I enjoyed making recently. I’m constantly looking for new dishes to try and cook, and sometimes recipes come to me through uncommon sources as well. 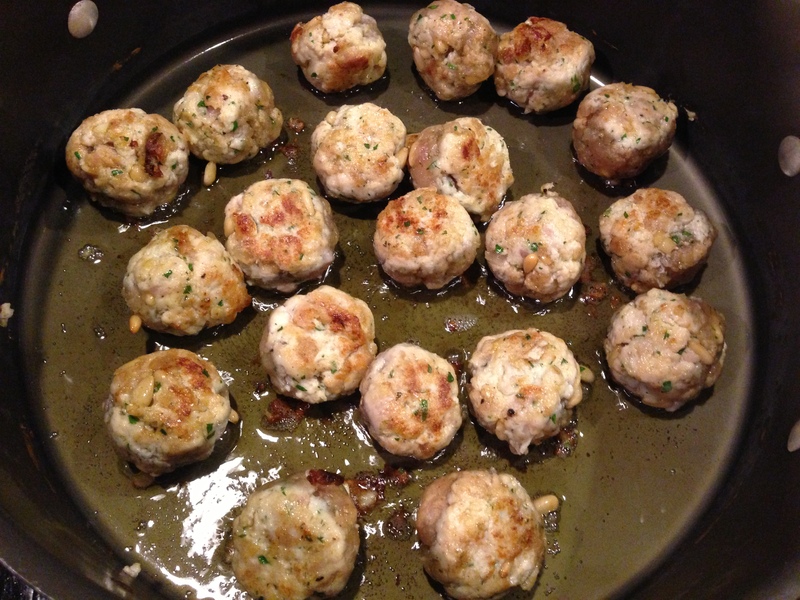 I was emailed this recipe for Tuna Meatballs with bouillabaisse from Cakebread Cellars in Napa. 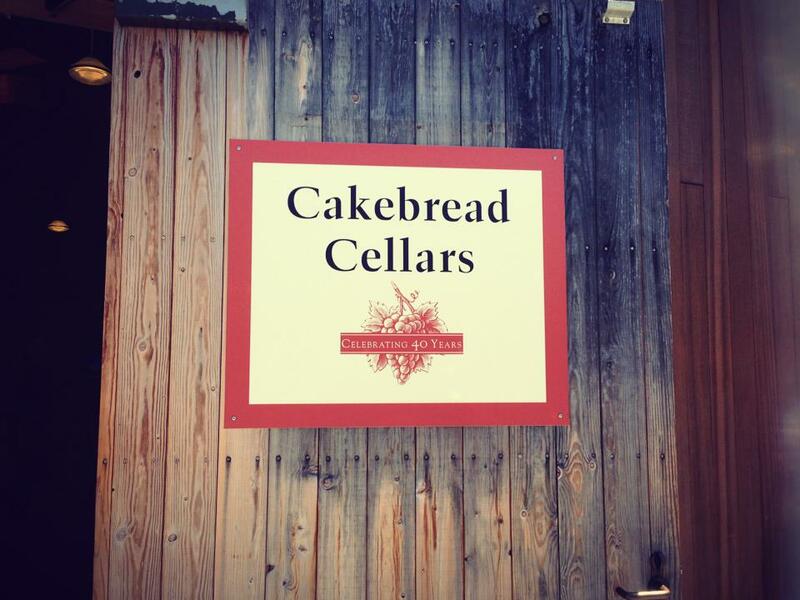 We had spent Fourth of July weekend this year eating and drinking wine in Napa, and out of the 10 Vineyards we visited, Cakebread was my favourite. Their Pinot Noir was phenomenal and really stood out against all the other wine we had tasted in Napa. We ordered a case and inadvertently signed up for their email newsletter as well. I usually hate product newsletters, but this one came with a recipe pairing for their new Chardonnay. I reviewed the recipe and started to research it online. Polpette Di Tonno, meaning Meatballs of tuna, is of Mediterranean origin. I couldn’t find the specific country of origin from my research, but it has been referenced as both Italian and Sicilian. The meatballs are composed of fresh ground tuna and or swordfish, bread crumbs, grated Parmesan cheese, pine nuts and parsley, and it is usually served in a tomato based marinara sauce over pasta. 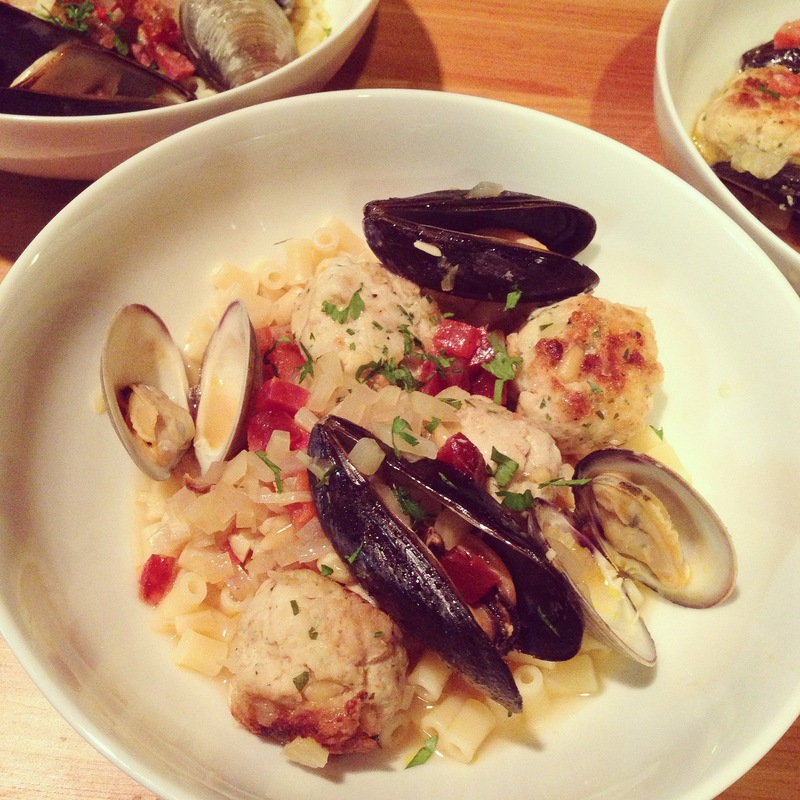 The Cakebread recipe is a mash-up of a french style Bouillabaisse with clams, mussels, and the tuna meatballs. There are some differences between the tuna meatball recipes I found online and the Cakebread recipe, so I just added the ingredients I liked and it came out delicious. 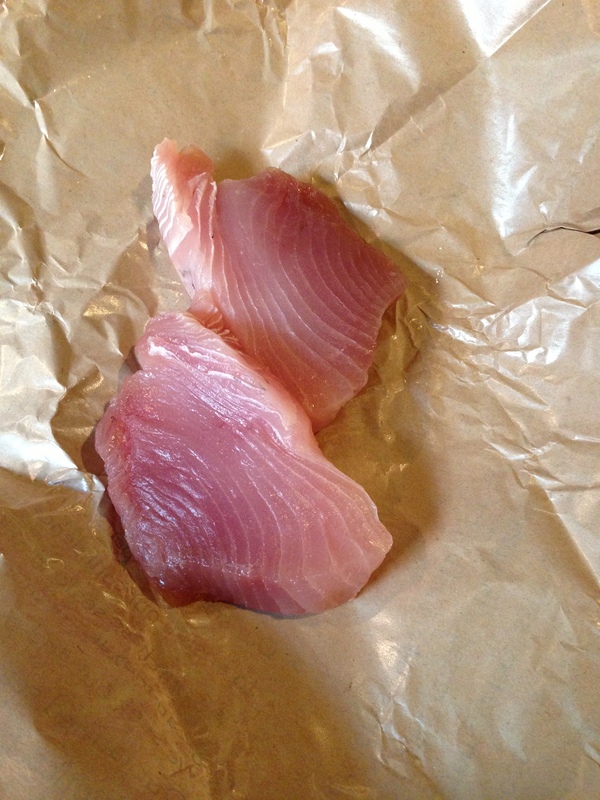 For the tuna meatballs, the Cakebread recipe called for Yellowfin tuna, but I used fresh Albacore steaks I found at Whole Foods. 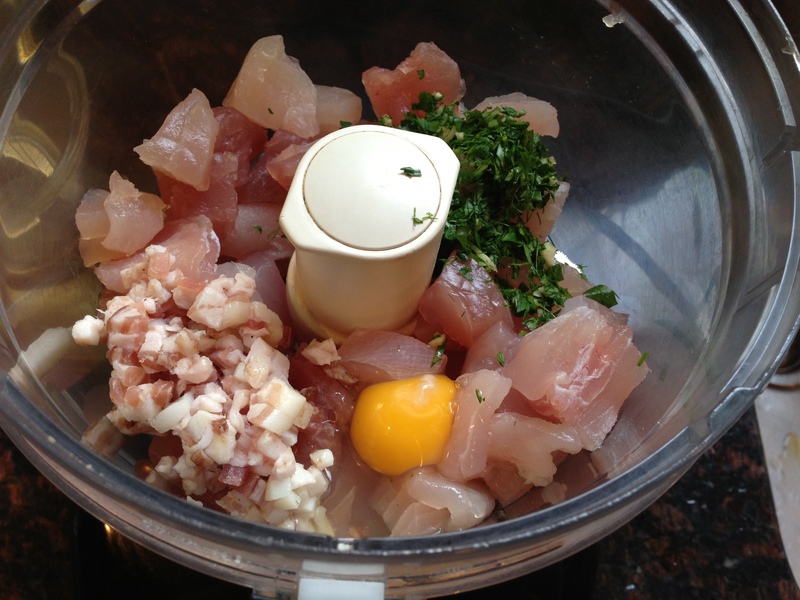 To make the meatballs, dice the tuna steaks into 1 inch cubes, then process them together with finely diced pancetta, egg, chopped parsley, and garlic. Take care not to over process, just long enough to evenly distribute all the ingredients. 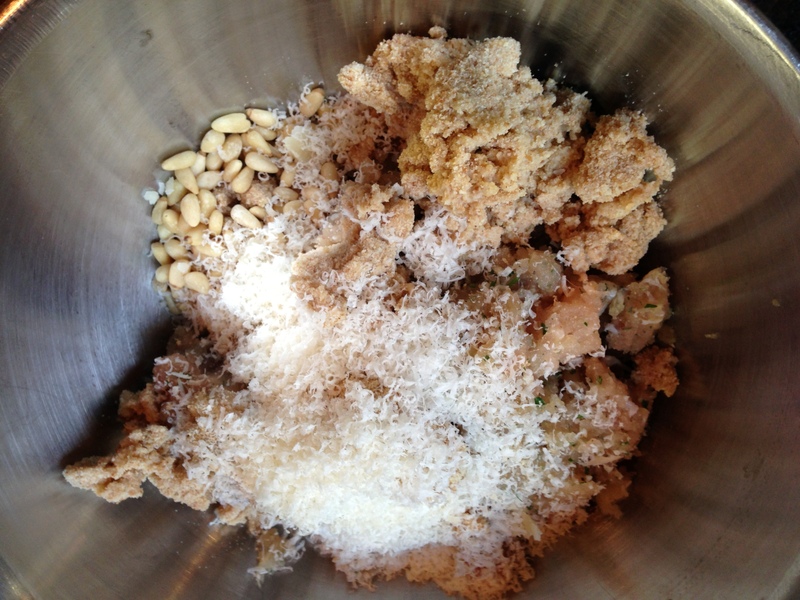 Transfer the tuna mixture to a large bowl and toss in the bread crumbs, pine nuts (about 2 to 3 Tbs for 1.5lbs of tuna), and grated Parmesan cheese (about 1/4 cup for 1.5 lbs of tuna). Mix evenly with your hands. 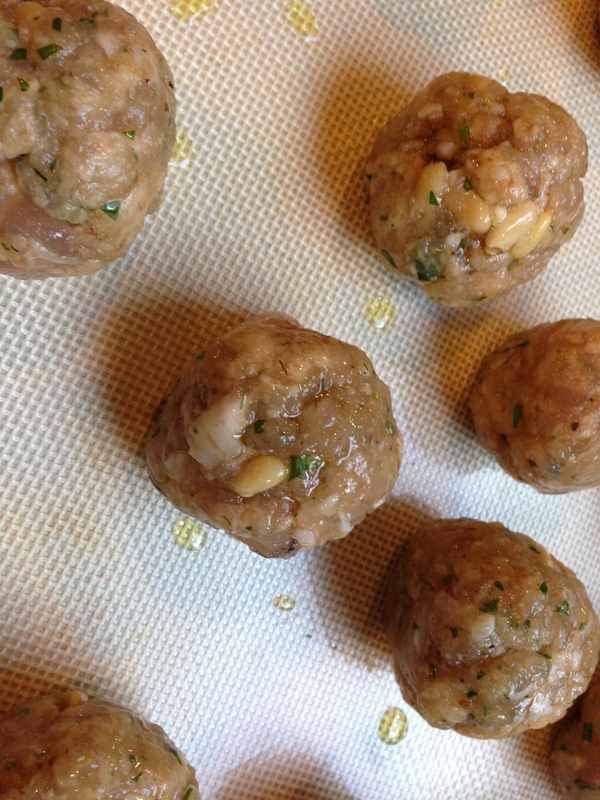 The addition of the pine nuts and Parmesan are not a part of the Cakebread recipe, but almost all other tuna meatball recipes online that I found had them. Using wet hands, shape the tuna mixture into golf ball sized rounds. If your mixture is too dry, add milk by the tablespoonful until the tuna balls can hold shape; if your mixture is too wet, add breadcrumbs by the tablespoonful until the desired consistency is reached. Brush the meatballs with olive oil and set in the fridge while you prepare the Bouillabaisse. 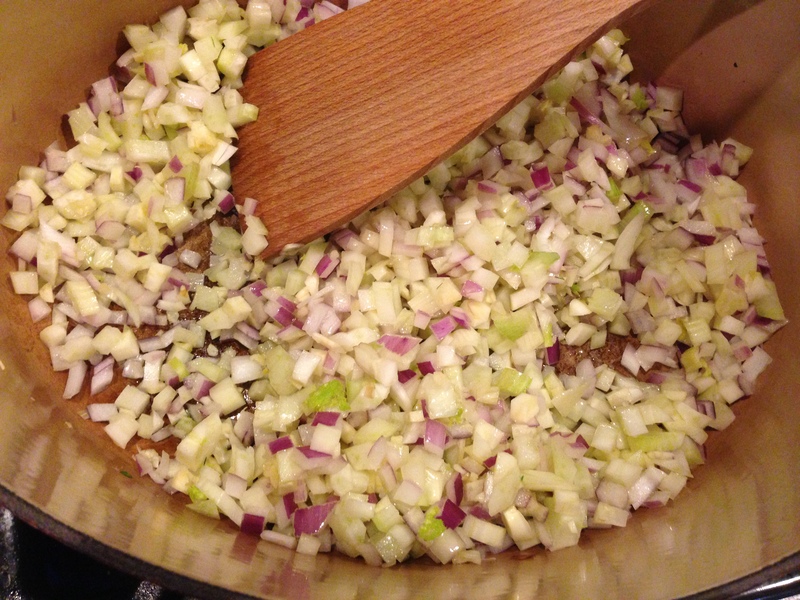 To make the Bouillabaisse broth, saute chopped fennel, onions, and garlic in a heavy bottomed pot over medium heat with some olive oil. This will not be the final vessel where the mollusks and the meatballs will be cooked, so make sure you leave your largest pot for that. I substituted red onions for regular onions because that’s all I had in my pantry. 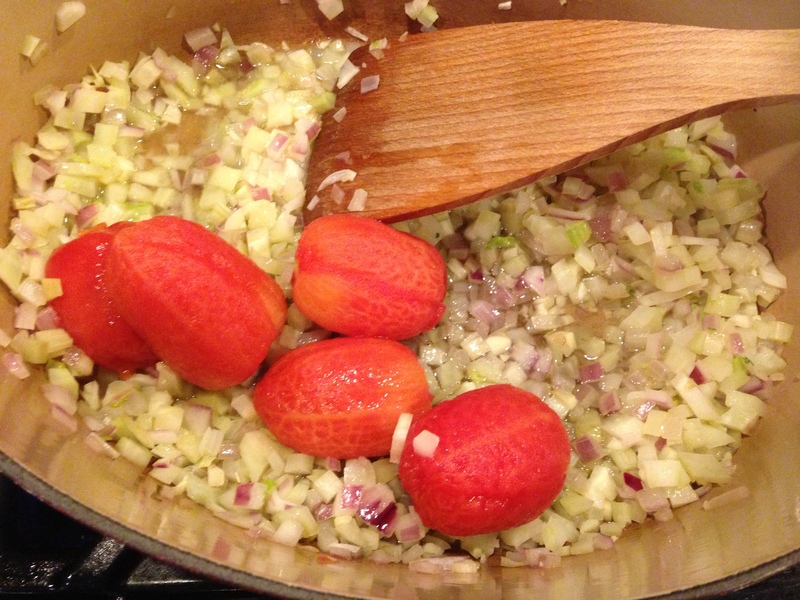 Once the vegetables are soft, add in peeled plum tomatoes and the white wine to the pot and bring to a simmer. You can use drained canned whole plum tomatoes, but I used fresh plum tomatoes blanched in boiling water for 20 seconds, and peeled them myself. Add the saffron threads and smoked paprika, and cook for about 5 minutes, then add the fish stock, bay leaf, and thyme sprigs. Simmer over low heat for 30 minutes. The Cakebread recipe calls for passing the broth through a food mill to finish, but I skipped this step as I was making this during a weeknight and was in a hurry. 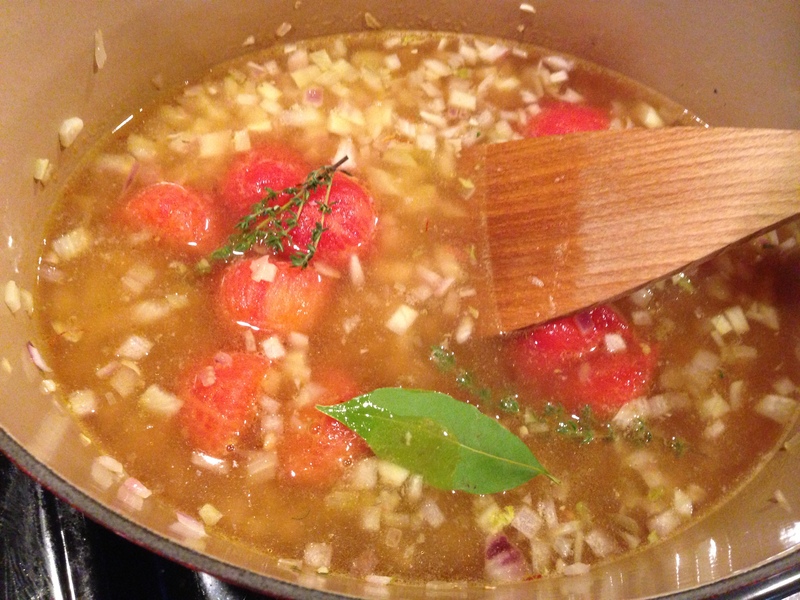 For the final part of the recipe, heat up some olive oil over medium high heat in a large, wide bottomed pot. Make sure the pot is large enough to hold the meatballs, the mollusks, and the broth. Brown the tuna meatballs on two sides. 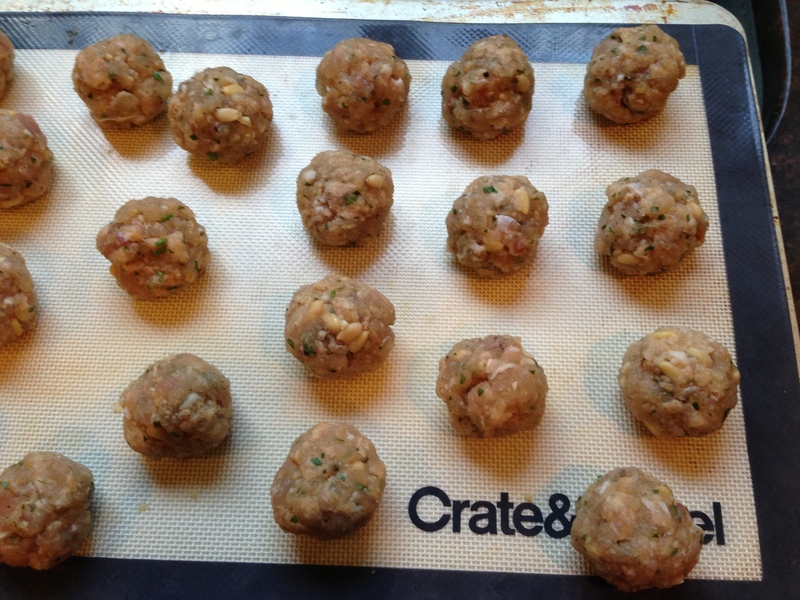 Take care to not turn the tuna meatballs until their bottom side is completely browned and comes off easily. While I was searing the meatballs, I also started a pot of water for cooking the pasta for this dish. I choose Tubetti and in a bid to make it healthier, I only used 3/4 of a cup of uncooked pasta. Once the Tuna meatballs have been turned and browned on both sides, add in the mollusks and the broth into the pot, turn up the heat to high, cover the pot and let cook until majority if not all of the mollusks have opened up. The recipe says it only takes 5 minutes for the mollusks to open, but I’ve found in my experiences that it takes longer depending on your heat source and how big your pot is. 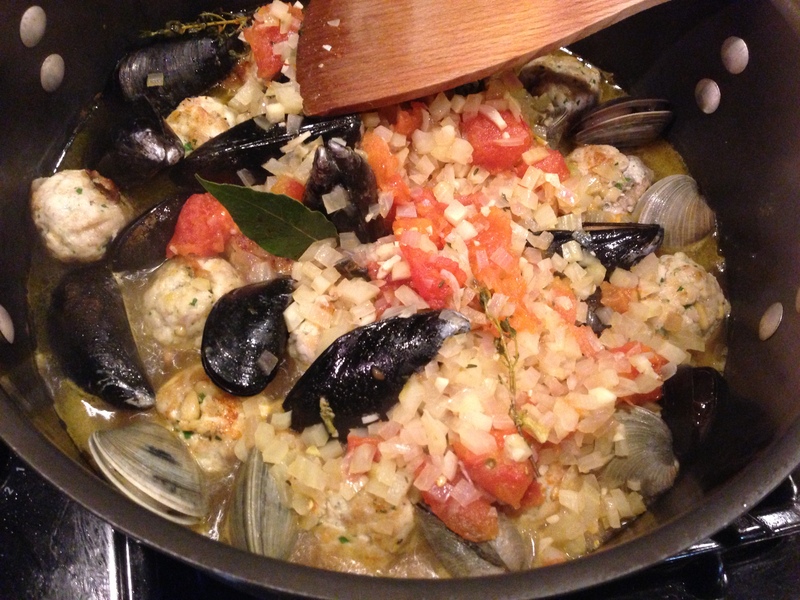 It took about 10 – 15 minutes for all the clams and mussels to open when I made this recipe. To serve, I divided the Tubetti among serving bowls, ladeled the broth over the pasta along with a few meatballs. 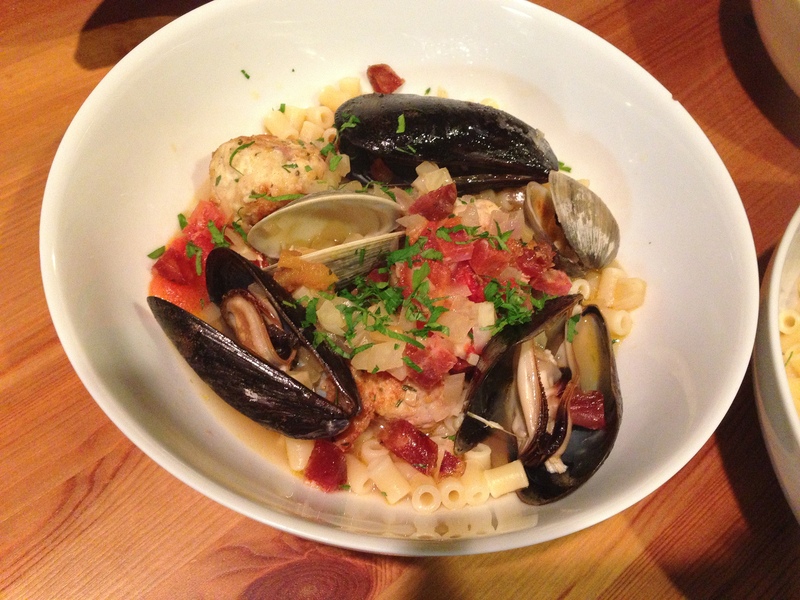 Then I garnished the dish with mussels and clams and topped with chopped chorizo and a sprinkle of fresh chopped parsley. I really enjoyed making this dish, and will be trying more recipes from the Cakebread Cellars.